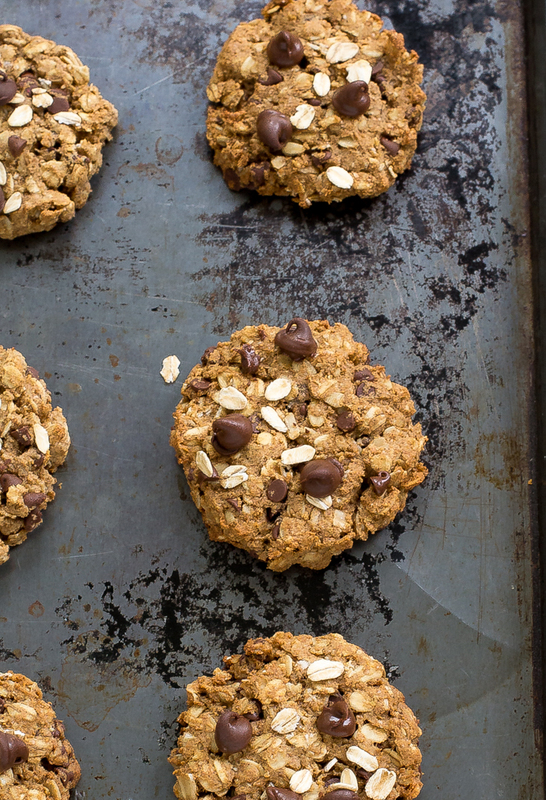 Breakfast Cookies loaded with oats, peanut butter and chocolate chips. 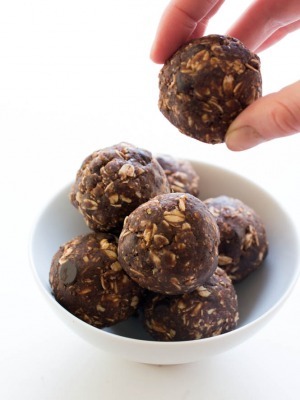 Wonderful for breakfast or as a healthy protein packed snack! What better way to start you day then with a cookie. Especially one you don’t have to feel guilty about! 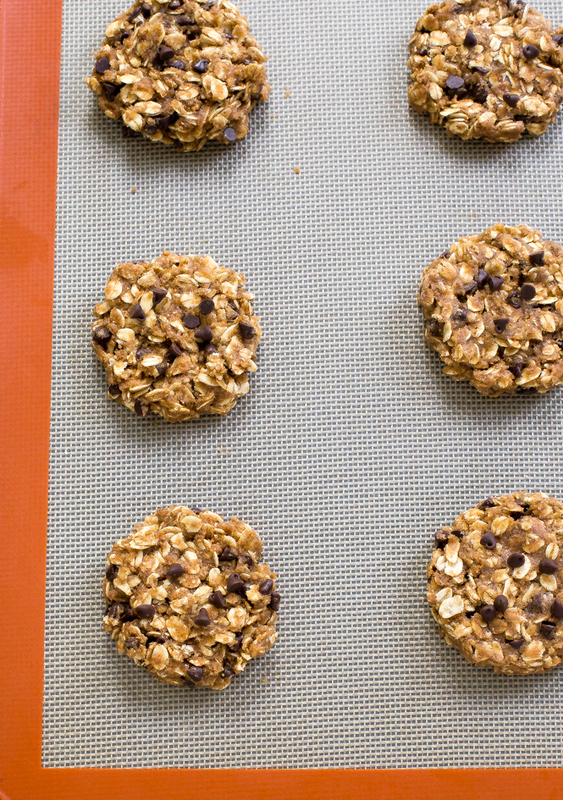 These Breakfast cookies are loaded with healthy ingredients that will keep you full throughout the day. There is no butter or oil in these cookies just healthy natural ingredients. These Breakfast Cookies are a great grab and go breakfast or snack. To sweeten the cookies I add a bit of maple syrup and a little brown sugar. You can substitute honey in place of the maple syrup if you prefer. For protein and fiber I add in old fashioned oats and peanut butter. Both of these ingredients give you a quick energy boost and help to keep your full throughout the day. 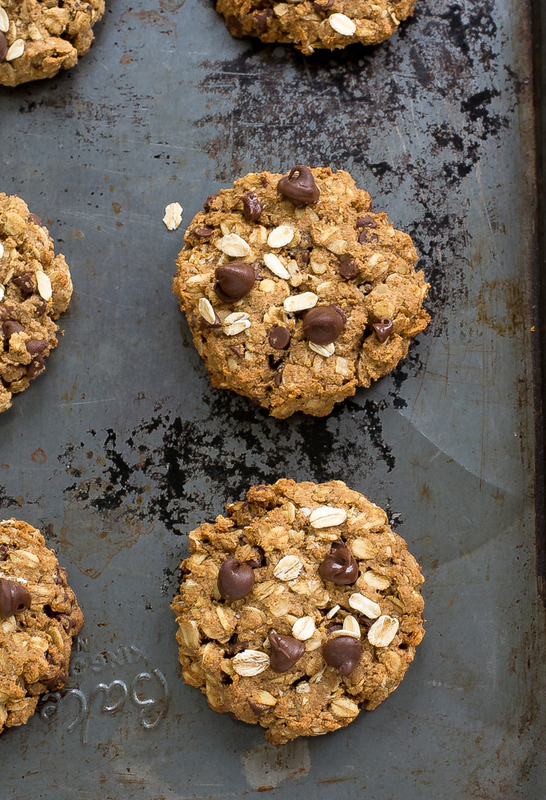 These breakfast cookies are super easy to make. 20 minutes and two bowls is all that is needed. No mixed required. To make these breakfast cookies combine the dry ingredients in one bowl and the wet ingredients in another. Add the wet ingredients to the dry ingredients and stir to combine. Portion out heaping tablespoon cookies onto a baking sheet lined with a silicon mat. Smash the cookie down to flatten it out. (Cookies do not puff up or spread a lot in the oven) Bake for 9-10 minutes or until slightly browned and they appear firm. Cool for a couple of minutes on the baking sheet and transfer to a wire rack to cool completely. The best thing about these cookies is that you can experiment with some of the ingredients. I like to add in flax seed or wheat germ to the cookies if I have them on hand. Nuts, dried fruit, shredded coconut can also be added. 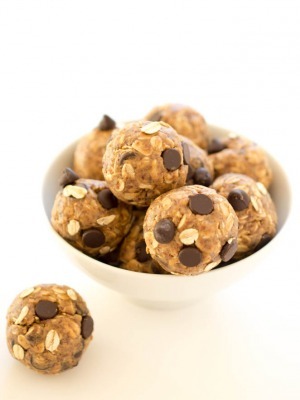 Combine oats, flour, cinnamon, baking soda and chocolate chips in a large bowl. Combine peanut butter, apple sauce, maple syrup, brown sugar and egg in a medium bowl. Bake for 9-10 minutes or until slightly browned and they appear firm. Cool for a couple of minutes on the baking sheet and transfer to a wire rack to cool completely. This recipe yields 16 cookies. I do not know the calorie count on these but I would suggest a serving size of 1 or 2 cookies per serving. I hope that helps! I have not frozen these before so it is hard to say for sure. Personally I would make them, allow them to cool then freeze them. Hope this helps & you enjoy!! Would it ok using white flour in place of whole wheat? Yes that would be fine Audrey. Thanks! thanks for asking this 🙂 Making them now! Just made these.. they taste great, a bit dry, but I like that because I love to dunk my “cookies.” One note: I did add a bit more applesauce because I couldn’t get the rest of the flour to mix in. I added half a cup of crasins to it as well and a little extra apple sauce it was perfect! Great recipe! I have some nutrition info. I did however modify* from the original recipe so will be slightly different for the original recipe. I used a Tbsp scoop which yielded 38 cookies (instead of 16). Hope this helps someone. Pretty good and guilt free! Can you substitute quick oats for old fashioned oats? Yes they can be substituted. Hello, how and for long should these be stored? Realized I left mine on the cpunter, hoping they don’t need refrigerated. 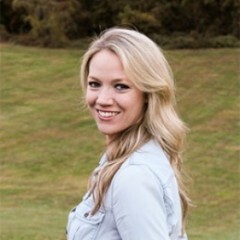 Also mine were dry as well and hard to get to stick together. is extra applesauce recommended or something else? I would leave these at room temperature in an airtight container for up to a week. Also I am surprised to hear they were dry. Did you happen to cook longer than 9-10 minutes? Hopefully storing in an airtight container will soften them up for you. I have a nut allergy in my home. Will the recipe do okay without the nut butter? I would try substituting a soy nut butter or nutella for the peanut butter. I forgo to smash them before sliding them in the oven but they were still really good! I added 2 TBS of flax seed and a splash of milk to make up for the added thickness and they were delicious. Thank you! Instead of cookies, can this recipe used for muffins instead? It would be a delicious “breakfast to-go”. I have not tried making this recipe yet into muffins so it is hard to say for sure. The cookies are still a good grab and go breakfast! In our foods and nutrition class we made these cookies. I personally thought they were bland and dry but other than that I think they were nutritionally pleasing and an easy make. Hi, in our Foods and Nutrition class we made this recipe and we balled them up instead of flattening them into cookie form. They came out very well and we definitely enjoyed them! The only critique is that we think less oats would be better. These are pretty good! One word of warning–DO NOT leave out the chocolate chips (and raisins). I added them in last minute (my son was watching and STRONGLY suggested the chocolate chips) and I think they would have suffered without. The lack of oil makes these a wee bit dry, but the chocolate chip mitigates that. Cheers! I just made these – they’re very good!! Mine did not turn out dry at all. I used the maple syrup, and regular flour. I didn’t have applesauce on hand, so I used 1 ripe banana, smashed, which equaled 1/2 C., so that was slightly more than the applesauce. (It’s not enough to give it a banana flavor.) I also added about 1/2 C dried cranberries. Each cookie was about 1/3 C dough, baked for 11 mins in my oven. It made 14 cookies. I think you can do a lot with this, to suit your tastes or use ingredients you have on hand. Thanks for the great recipe! These are amazing! Thank you for the recipe! So glad to hear you enjoyed this!! Thank you! For the applesauce, Apricot or peach puree would work as well as yogurt sour cream or oil. As for the peanut butter you could use coconut butter or sunflower seed butter. I hope this helps!! Thanks! We just made these today. They are pretty good! Mildly sweet and almost muffin-like in texture (but not quite). We subbed raisins for the chocolate chips since this will be an “on the go” breakfast for the kids–chocolate tends to smear and make them messy which isn’t good when we get to school. We also tossed in some pecans. I made this recipe today and really enjoyed the cookies! I’m excited to have these for a mid-morning snack this week. Thank you for sharing! Glad to hear you enjoyed this! Thank you! I’m in love with this recipe, they are delicious. Just wondering if they can be frozen and then warmed up in the microwave? I’m wanting to make a large amount and do that. Yes these can be frozen and reheated in the microwave. I would do it on a low power to not scorch it. It will be a bit crumbly I’m thinking if you reheat in the microwave just fyi. Let me know how you make out. Thanks! I used almond flour instead of wheat flour for a GF treat..
sounds delicious, I’ll definitely be trying that! Would any type of flour work? Almond, oat, rice?? Thanks. I think those flours alternatives would work out just fine. Let me know how you make out.